I'm itching to get the boat out of storage and pondering some tweaks Im hoping to make this year. 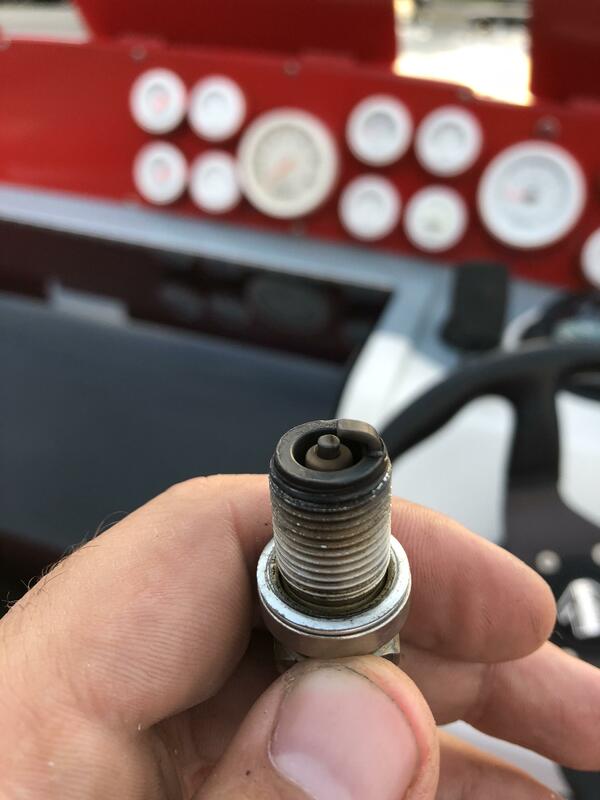 Below are some of the plugs I pulled late in the season last year after I got it running good speeds. I still think there is more in the setup though, so I'm focusing on the jetting for now. Without going into detail on the engine builds/current jetting, do you think these are still showing a rich condition? These were pulled from different cylinders, from both motors. I don't recall which, but I was just looking to get some other opinions on if I can lean out the jetting or leave it as-is. 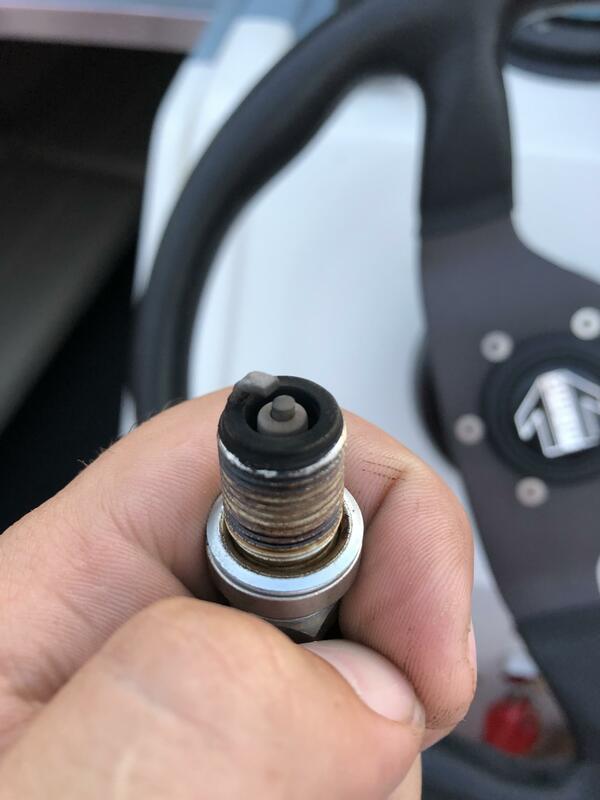 Your going to need to put new plugs in it the same time your going to check them. to hard to tell what you got now. They have idle time on them. Griff and Crude Intentions like this. I can idle for an hour and my plugs don't look that rich and I'm running a big cam and carb. You have three circuits to consider, idle, cruise and full throttle. 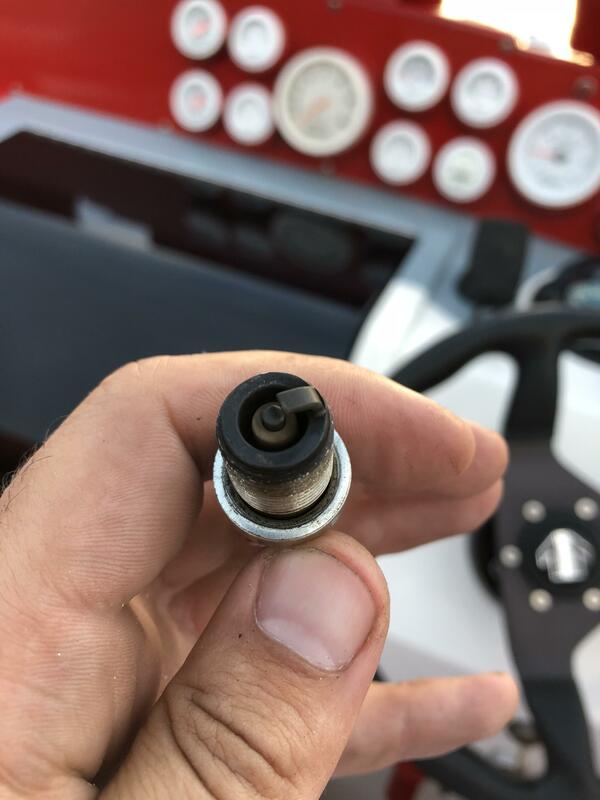 You need to sort out the idle first so you don't soot up the plugs just getting out of the marina. Your cruise is a function of full throttle so getting full throttle close is next. If your idle is anywhere near close you are running pretty rich. I would also recommend going to Walmart and getting an Otoscope so you can see the heat mark on the ground electrode and porcelain color at the base as well. What engine and intake you yunning. Staggered jetting is pretty common and if I'm not mistaken merc did on the hp500 with the 800 cfm holley 8022 carb. Intake runner length, volume and csa can play a part and when I had a basic hp 500 copy build I got it dialed in real close with some staggering. Sometimes cam grinders will take this into consideration to help compensate lift/duration especially on 5,7 and 4,6. I've never done that but it is not uncommon. Good intake porting and filling, material removal help also. Difficult to get them all close to equal. I think you'll get it close with staggered jetting if need be. Both post above good info. Wouldn't jump the gun on anything until you get new plugs and check. WOT and ck then same at cruising speed. You'll likely idle back rockers the dock/ramp and see changes again. Last edited by getrdunn; 04-17-2019 at 05:59 PM.